IN THE STUDIO THIS WEEK: The Portsmouth Business Expo welcomed Glow. #InTheStudioThisWeek the Portsmouth Business Expo welcomed Glow. The Portsmouth Business Expo took place on Thursday 12 July 2018 at the Pyramids Centre and, this year, Glow was in attendance as an exhibitor. 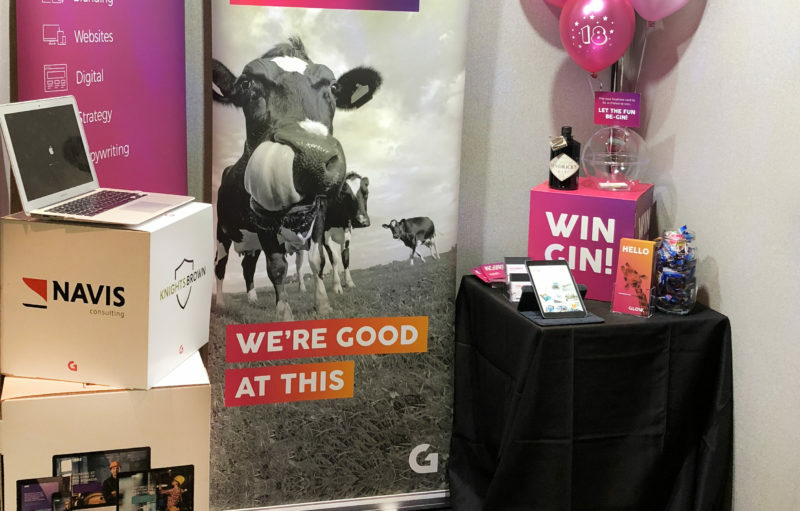 We visited the Southampton Business Expo at the Ageas Bowl in 2017 and decided that our 2018 mission would be to attend and exhibit at more shows, to expose the businesses of the South to our Glow brand and services, and turn the exhibition halls a little more pink – plus, we love a good chat! The Business Expo is an event for ambitious businesses who are looking to grow and prosper in Portsmouth. It’s a great networking opportunity, has a seminar programme, keynote speakers, and is free to attend for visitors. 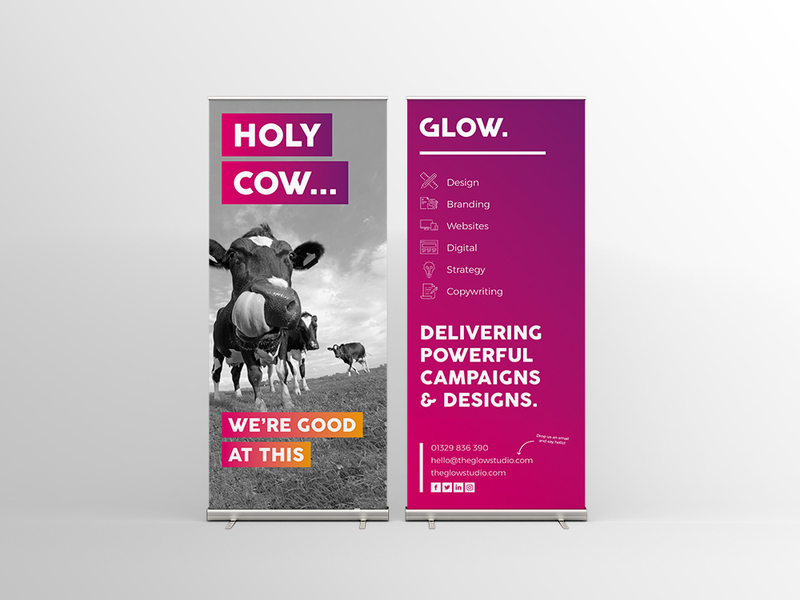 The Glow team really wanted our stall to stand out, so we created our ‘conversational piece’ banner using a giant picture of cow with its tongue stuck up its nose – and it worked! We had lots of visitors commenting on how it had drawn them in, and put a smile on their faces. 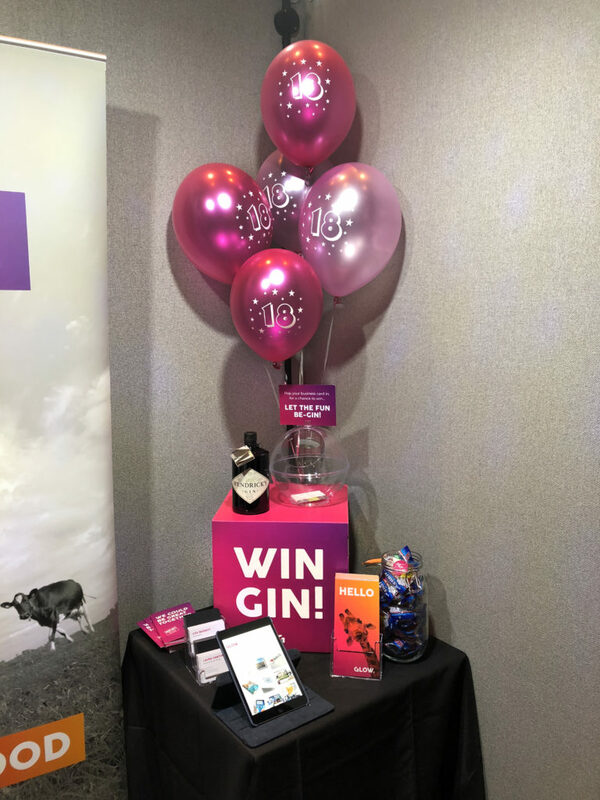 It wasn’t just the cow banner that was interesting, we’d designed large, promotional stacking boxes to feature some of our portfolio pieces and our ‘WIN GIN!’ competition helped to pull the crowds in too. For a small stand, we packed a lot in! 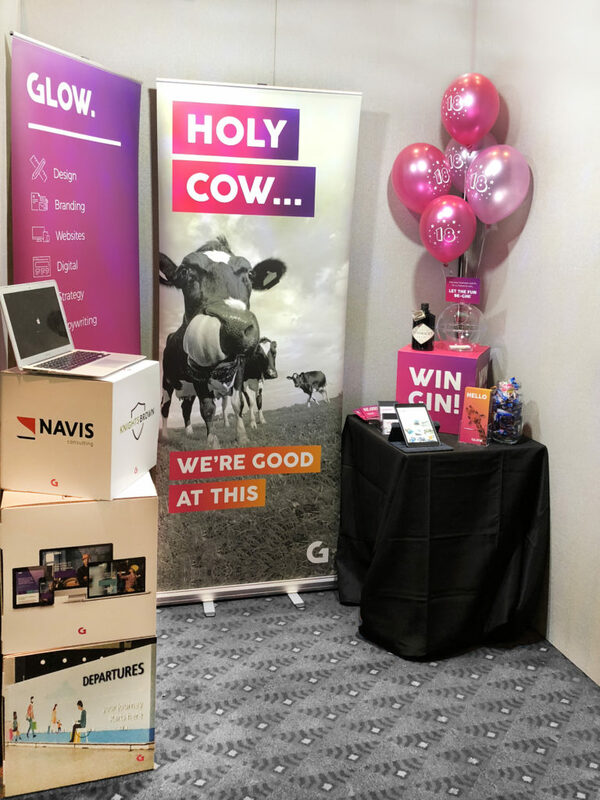 We had lots of people approach us, interested to hear more about Glow and what we do and it was a great chance to tell people that Glow has recently celebrated its 18th birthday (our stand also had helium-filled ‘18th birthday’ balloons and our animation playing). Laura had her five minutes of fame and was filmed for a promotional video for the event, we’re not sure if she’ll make the final cut, but we’ll be sure to share it with you when it’s available. We loved talking to all the attendees, as well as the other exhibitors, and even managed to catch up with some of our own lovely suppliers, Tekkers IT and Digital Dinos. We’ll also be exhibiting at the Southampton Business Expo on 15 November at the Ageas Bowl – we’d love to see you there!